“The Count of Monte Cristo” (Le Comte de Monte-Cristo, 1844) is an adventure novel by French author Alexandre Dumas (père). It ranks among the literary classics and tells the epic story of Edmond Dantès, a wrongfully imprisoned man, who –after his escape- unearths a spectacular hidden-treasure on the Isle of Monte Cristo. Backed by these riches, he sets about getting revenge with a series of vendettas delivered with so much violent verve that he makes James Bond and Ethan Hunt pale in comparison. 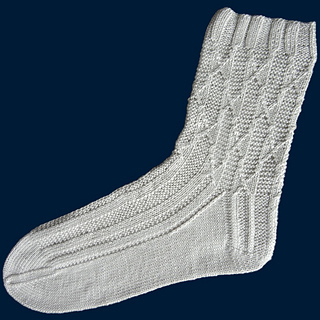 The pattern on the leg of the socks is called “heraldic” and shows crossed swords and battle-flags – a perfect fit for the coat of arms of the Count. It doesn’t hurt either that Barbara Walker describes this pattern in her 2nd treasury of knitting patterns as “exceedingly handsome”. 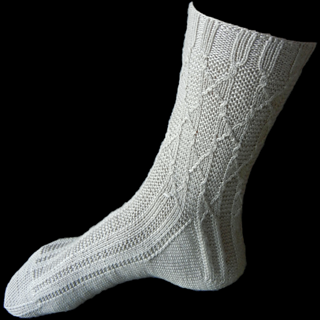 The foot of the sock is worked in a simple rib which makes it fit snugly inside your shoes, but if you’d prefer you could easily make the leg pattern continue onto the foot.